They were improbable co-stars of an elite, wireless-oriented tech show — a weed whacker, a blender and a boombox. Their high-decibel assault was the perfect foil for the most celebrated product at this year's 6th annual DEMOmobile show, a noise-canceling cell phone headset called Jawbone. The headset, developed with Pentagon funding to isolate the human voice while suppressing the clamor and clatter of battle, silenced all three audible offenders. Tech executives, investors and journalists cheered as the device was demonstrated by the two founders of its maker, Aliph, based in Brisbane, Calif. The headset, which went on sale last week for $150 and works on only about two of every five cell phones sold in the United States, was among 35 products demonstrated at the two-day show that ended Friday, an eclectic array of hardware, software and services aimed at the ever more discriminating digital consumer. "Mobile and wireless are just totally integrated now into our work and play," said Chris Shipley, the IDG show's executive producer. Wi-Fi wireless and Voice over Internet or VoIP phoning have tossed the telecommunications industry into tumult, making traditional carriers desperate for new streams of revenue. Tales were swapped on the show's sidelines of traditional telephone service ditched at home and the office in favor of a combination of VoIP and cellular. Luxembourg-based Skype Technologies S.A., the rave of the VoIP revolution, showed off its software for Pocket PC-based handheld computers that lets any Skype user in a Wi-Fi cloud make a free Internet voice call to other Skype users. Company founder Niklas Zennstrom called from Europe and the audio quality was enough to make a telecom exec squirm. 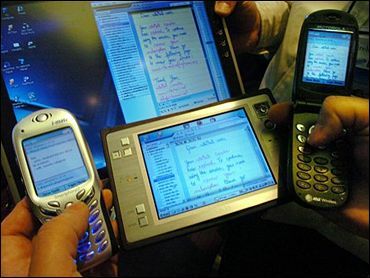 A Palm OS version is promised for next month, and the software also supports a paid SkypeOut service (two cents per minute for U.S. calls) for connecting with traditional phones worldwide. Also turning up the heat on the traditional telecoms were new consumer VoIP adapters displayed by show sponsor Linksys, now a division of Cisco Systems Inc.
A new voice product from a San Jose, Calif., company called Orative is like having a clutch of virtual phone receptionists who don't take coffee breaks. Orative's service lets cell phone users notify each other when they will be available to take a call. They can also prioritize callbacks based on urgency. You'll never look at a cell phone the same way after you've seen the handset that Finnish company F-Origin Ltd. debuted at DEMOmobile. Its software and engineering tackle the vexing problem of viewing Web pages and other big, graphical files on a cell phone's tiny screen without too much shrinkage. To scroll up and down or across a page on the virtual display you simply tilt the phone. Rotate from vertical to horizontal and the display automatically switches from portrait to landscape mode. And the touchscreen and other nontraditional "buttons" provide tactile feedback. F-Origin is looking for partners and has no intention of getting into the hardware business, so you can't buy an F-Origin handset.